I've said it before, but I think its a message that's worth repeating - Does your rubbish really need to be put in a plastic bag? An article over at The Conversation, 'Plastic, like diamonds, is forever: time to use fewer bags', resulted in a number of comments about what people would use as bin liners if plastic bags were banned and about then having to buy bin liners. But why do we need to line our bin with plastic? A plastic bag is totally unnecessary. We put our rubbish in a small indoor plastic bin and then when it's full we transfer it to a larger outdoor bin, which is eventually tipped into a garbage truck. Why do we need the plastic bag? Instead of using a plastic bag we place newspaper in the base of our bin* and when it's full we pick up the bin and take it outside and tip it in the garbage bin. Simple. What goes in our bin is mostly dry because we also have a small bin for worm scraps, another for compost, and a third for the guinea pigs and chickens. Have you managed to wean yourself off using plastic shopping bags? What do you put your rubbish in? I spotted some native raspberries a few weeks back when on a bushwalk. I tasted a few but found them rather tasteless. Back home I learnt that what I'd tasted was probably Rubus rosifolius, commonly known as Native Raspberry or Rose Rose-leaf Bramble. It's described as having 'edible but insipid' fruit. Yep, that's what I tasted. The Small Leaf Bramble (Rubus parvifolius) apparently has fruit that 'varies immensely in quality but when it's good, it's very, very good'. A tea made from the leaves of Molucca Bramble is known to relieve upset stomachs. The gorgeous Atherton Raspberry (Rubus probus) is so good its commercially cultivated and sold as a punnet fruit and widely grown as a garden plant. There's actually 10 native raspberries known within Australia - but thankfully all have edible fruit, so you don't need to worry too much about working out which Rubus species you have. Although - for the super keen you can even get an interactive CD ROM which will help you identify any species of Rubus presently known to occur in Australia (including the numerous introduced Blackberry species). Have you noticed or even tasted native Raspberries? This post is part of the Foraging Friday series. I’m sharing a Foraging Friday post each fortnight – on the Second and Fourth Friday of each month. I welcome you to join me by sharing a recent foraging experience in the comment section or by leaving a link to your own Foraging Friday post. I was a little surprised last week to read that supermarket private label product sales have grown by 85 per cent in the past five years and that private label products are expected to make up around a third of supermarket sales within five years. Do people really think that the supermarkets won't increase their prices once they have wiped out the competitor brands? 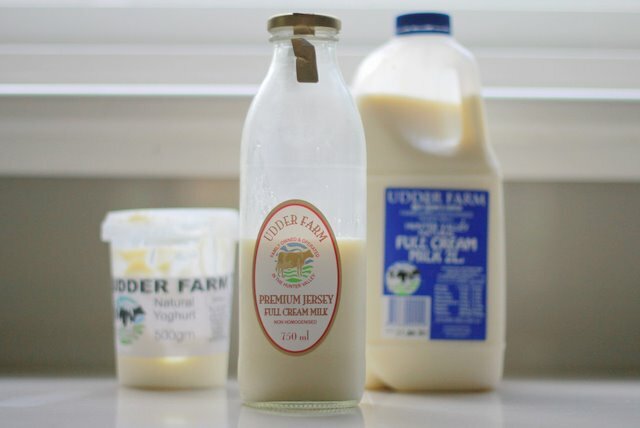 All this discounting means that someone is paying the cost of purchasing $1 litres of milk and $2 loaves of bread - and it's usually the producers - like Milk Maid Marian who wrote recently about how falling milk prices affect her dairy cows. The major supermarkets are now introducing premium, organic and fair trade products to try and attract private-label buyers 'from all walks of life'. Sneaky -lets just hope that people who are prepared to pay a premium for organic and fair trade aren't prepared to buy supermarket own labels. Has anyone, partuicularly those of you in small regional towns, been forced to buy a supermarket own label because there was no other option? We're still going well with the Skipping the Supermarket Challenge and I'm pretty certain we'll likely continue to skip supermarkets next year. Although I suspect moving to a regional area is going to test us. How are you going with skipping the supermarket? We had our first working bee at our little farm on the weekend. I invited a few colleagues along for a 'flora and fauna ID party' to start a species list for the property. After a few hours we had a list of over 100 plant species. Although I'm a plant ecologist, my plant identification skills are pretty rusty so it would have taken me weeks to get this list. I’m going to embrace working bees on our little farm. and they provide an opportunity to learn from friends. Have you hosted a working bee? Or do you enjoy attending working bees? Have you got any advice for me on what makes a working bee successful? I'm guessing providing good food and drink is pretty important? Little Eco woke up tired and cold yesterday and didn’t want to get out of bed. She begged to say home from preschool. After ruling out there being any other reason for her not wanting to go to preschool I let her stay home – on the condition that she stay in bed until morning tea. She excitedly agreed. She kept her side of the bargain and relaxed in bed reading and talking to herself. She left the bedroom a couple of hours later relaxed, bubbly and happy. I usually feel guilty when doing nothing. I know I shouldn’t. I know I rush around way too much and relax way too little. I need to learn the art of doing nothing. Hopefully Little Eco will grow up knowing that doing nothing is not something to be guilty about. On the topic of want I want for Little Eco, I wrote recently over at Childhood 101 about wanting her to know that happiness is something she can create. It’s not something she can buy. Do you feel guilty about doing nothing or is doing nothing something you are good at doing?